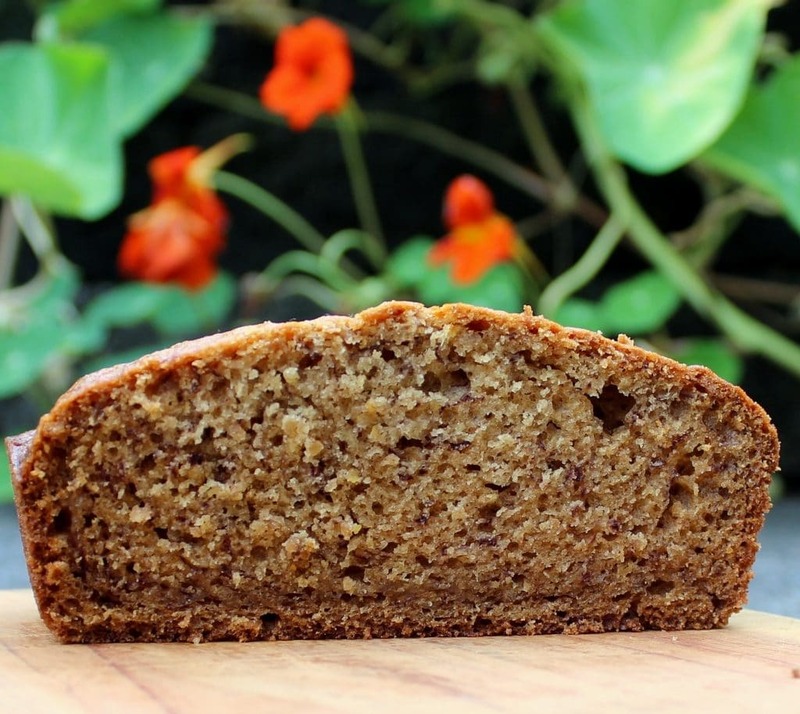 Make this healthy banana bread recipe with coconut oil, flax meal and pure maple syrup. Enjoy delicious banana flavor in a healthy, robust bread. This recipe has NO refined sugar. It’s so good! Healthy Banana Bread recipe is loaded with healthy fats and contains NO processed sugar! Quick breads are a staple around our house. 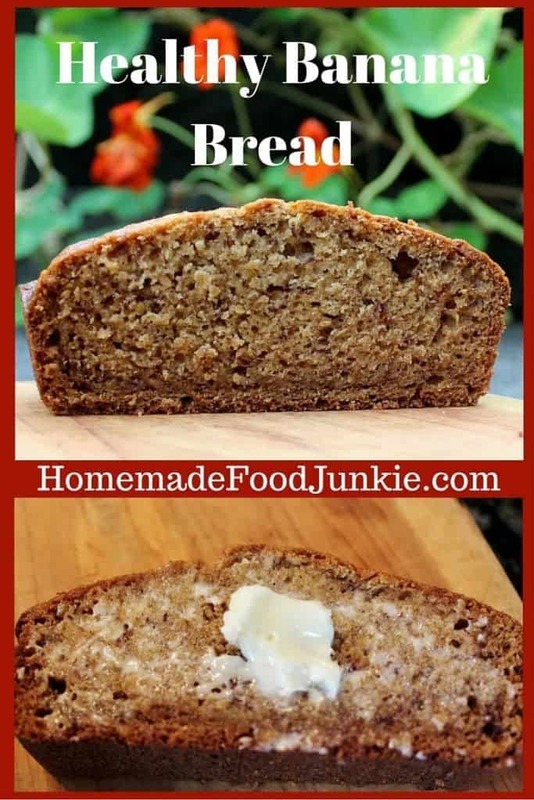 I make these fast desserts and breakfast breads all the time! Blueberry Banana Bread and Caramel Pecan Banana Date Bread are also excellent recipes with LOTS to recommend them! We love fresh-baked bread aroma wafting through the house. Once the bread is out of the oven people are asking how long before it cools enough to eat. It’s important to me to bake food that gives more than a tasty treat. I’m more willing to bake if I know the food I’m making is adding health and nutrition to our family. This recipe works for that and it’s delicious, which is important or no one at my house will eat it. Except me. That’s how I know I’ve got a winner. If I’m eating it all (and I will) It’s time to rethink my recipe. This one is a goody. Already one loaf down and it’s only been out of the oven a little while. I’m delighted because I’m not alone in the house! I’ve been baking successfully with coconut oil for several years. I’m not going back to other, processed cooking oils or, (most of the time), butter. Coconut oil is such a flavor enhancer I would probably use it even if it was only the same, nutritionally speaking, as other oils. Flax is also a great ingredient to include in quick breads and muffins. It’s full of good fat and fiber. You will find I use it in lots of my Quick Breads and muffins. Sweeteners are problematic. I have bounced from honey, to agave to coconut sugar looking for a better option to white sugar. They all offer benefits and I use them all periodically, and white sugar too. The problem is the glycemic index. I would like to lower it in my baking and still make satisfying, sweet enough, goods. We have WAY too Much sugar in our American Diet! The average American consumes about 140 POUNDS of sugar each year! Compare that to about 8 POUNDS a year in the late 1800s! Sugar is addicting. I thank the processed food industry for a large part of this problem. Processed foods are full of sugar in various forms. Step away from those handy boxes on the grocery shelf! It’s time to take control of our health back. Sugar reduction in our diet is a big step forward! Homemade with healthy, organic ingredients will enhance your diet, your health and free you from unhealthy food addictions! Today I invented this healthy banana bread recipe using maple syrup for a sweetener. Maple syrup has a glycemic index of 54 which is very low. The flavor is wonderful! Give me some feedback if you bake this recipe. I’d love to hear from you. Our family thinks it’s delicious! It has healthy fats, fiber and no processed sugar. Awesome! I hope you enjoy this recipe! In a separate, larger bowl, mix the wet ingredients thoroughly. Add the flour mixture into the wet ingredients in small batches and stir it as you go. Bake for 50 minutes or until a toothpick inserted comes out clean. This recipe makes a large single loaf or two thin loaves. I have made it both ways and it works fine. Adjust your baking time to 45 minutes for two small thin loaves. And do the toothpick test to ensure doneness. It’s really yummy Winnie. Thanks so much!